This folding side shelf attaches to our rolling tool carts (V1804OR and V2605R). Built from sturdy steel, this shelf is appropriate for professional use, and the powder-coated finish resists scratches better than standard paint. It fits securely in place when upright, and effortlessly folds down when not in use. 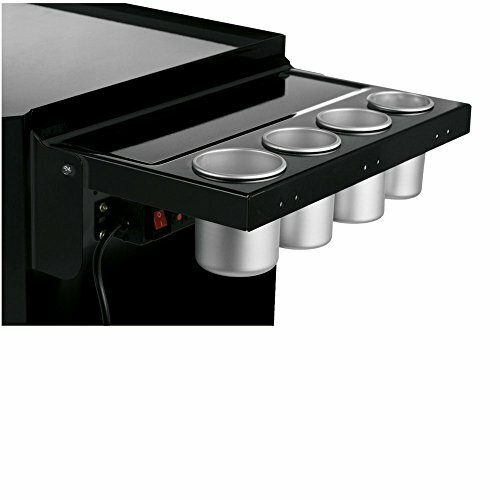 Four multi-size slots hold removable aluminum cups. A small 15 x 4 inch inset area helps keep small items from rolling off. The included 4-1/4 inch deep aluminum cups come in three sizes: One 3 1/4-inch diameter, two 3 inch diameter, one 2 3/4-inch diameter. The built-in power strip includes three 3-prong outlets with master power switch, global reset, and a 9 foot power cord. Rated Voltage: 125V 50-60Hz, Max Output Power: 1875W.